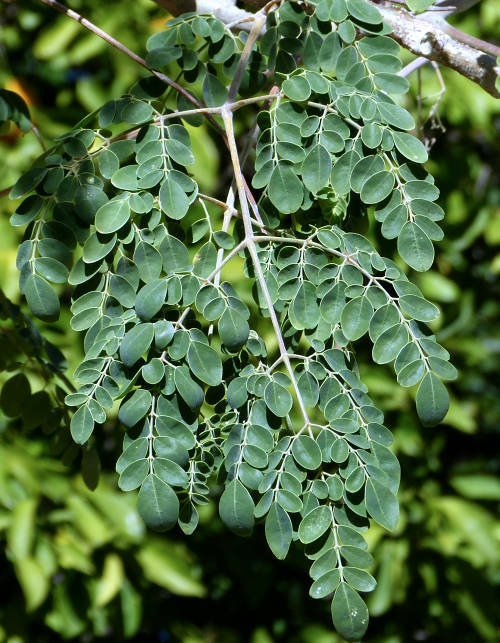 The Moringaceae family has one genus, Moringa, with 13 species. Moringa oleifera is the most widely cultivated species, grown throughout the tropics as a multipurpose food tree. More than 70 cultivated varieties have been developed in India. Lifespan: 4-40 years, depending on cultivar. Growth rate: Rapid, usually 10' a year. This tree can grow 20' a year in favorable conditions. Flowers: Small, yellow-white, sweetly fragrant, clustered. The flowers and buds are edible, but act as a diuretic in large amounts. Bloom: Twice a year or more in non-freezing regions: late fall to early winter and late spring to early summer. Years before fruiting: This tree fruits in its first year. Flowers appear 8 months after planting. Fruit: A very long, slender, ribbed pod containing round, edible seeds. The dried mature seeds are dark brown, round, with 3 white wings and are composed of 38-40% oil. For some cultivars, the fruit is bitter and inedible in later years, causing the plant to be grown as an annual. Months for fruit to ripen: 2-4, depending on cultivar. Storage after harvest: Store mature pods in a dry space. Leaves: The green, oval leaflets are edible. The tree provides light to light-medium shade. Stems: No thorns. New stems are slender and brittle, but become stronger in succeeding years. 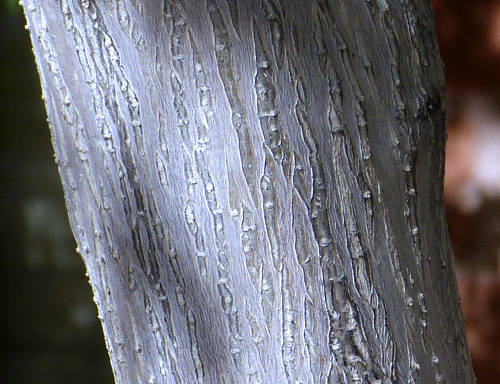 The trunk, with whitish-gray, corky bark, becomes more cold hardy with age. Roots: The tree grows a large taproot. The thick roots are edible and are a substitute for horseradish. They are prone to root rot in waterlogged soil. Wildlife: Attracts bees, butterflies, mammals. Toxic / Danger: The bark is mildly poisonous to humans. Eating more than two dried seeds can induce a laxative effect. Origin: Southern foothills of the Himalayas in northwest India. The plant has been in use more than 4000 years. USDA hardiness zones: 9-10. Protect from freezes. The plant will regrow from its roots if well mulched. It may lose leaves below 40°F. Heat tolerant: Yes, but will need extra water or afternoon shade above 90°F. Water after becoming established: Monthly to weekly depending on temperature. Yellow leaves are a sign of insufficient water. Soil: Very tolerant of any well drained soil, but does better in sandy soil with moderate organic content, pH 6.3-7.0 (slightly acidic to neutral). Fertilize: Unnecessary because of rapid growth. Mulch: Deeply in late fall to protect roots from freezes. Planting: Plant as soon as possible after the last frost in late winter or early spring so the roots will have time to become well established before the next winter freeze. The young seedlings must be protected by 18" high fencing so they will not be eaten by rabbits. The tree can be grown in large pots and moved inside in the winter. First Year Care: When growing as an edible leaf source, pinch off the top leader branch when the sapling is two feet tall. This will encourage side branching and produce more leaves within reach. As an edible seedpod source, it is often pulled up at the end of the year and new seeds planted in the spring. Prune: When used as an edible leaf source, cut the main trunk to a three foot stump every spring to keep the tree height under control for leaf harvesting. When used as an ornamental, do not prune until the first winter, then cut off all branches above head height to encourage branching and a wider tree form. After the last freeze in spring, cut off any dead wood. Litter: Leaf and seedpod drop in fall. Propagation: Cuttings, seed. Refrigerating or freezing the seed will kill it. Plant seeds no deeper than 1/2" in loose, well-draining soil. Seed germination rate decreases with the age and you may want to plant two or three seeds per hole. Seeds watered daily will often sprout in one week. Seedlings should be watered, moderately, every day until the trunk becomes woody. The soil should be dry the next morning to prevent root rot. Yellow leaves are a sign of not enough water. Young seedlings do not transplant well because their roots are fragile. If more than one seed sprouts in the same hole, cut the weaker ones off at ground level. Pulling a seedling out will damage the roots of the one remaining. Use rabbit proof fencing to prevent seedlings from becoming critter fodder. Uses: A shade tree or food source. As a shade tree, it will attain a 40' height within four years with a trunk up to 1.5' in diameter. Many parts of the plant are edible, especially the highly nutritious leaves. Used raw in salads, they taste similar to watercress or radicchio. Lightly cooked and added to chili, omelets, stew or soup, they taste like a nutty flavored spinach. While they contain oxalates, the oxalates are non-soluble, cannot contribute to kidney stones, and provide flavor without impairing health. The leaves have seven times the Vitamin C of oranges, four times the vitamin A of carrots, three times the potassium of bananas, at least twice the calcium of milk and two times the protein of yogurt. Teas made from the flowers or leaves have medicinal uses. In commercial cultivation, the trees are used to produce either leaves or seedpods, but not both. Young small seedpods can be used raw in salads or cooked like green beans. Older green pods, with the outer stringy coat scraped off, need longer cooking and have an asparagus taste. Pressing the seeds produces a non-drying, clear, odorless oil called Ben Oil, used for cooking and as a machine lubricant. The inedible seed cake remaining after oil extraction is used as a plant fertilizer. Cuttings and branches are used as livestock feed. The wood is too weak for construction but is good firewood. A blue dye can be made from the sap. Other common names are Miracle Tree, Horseradish Tree and Drumstick Tree. 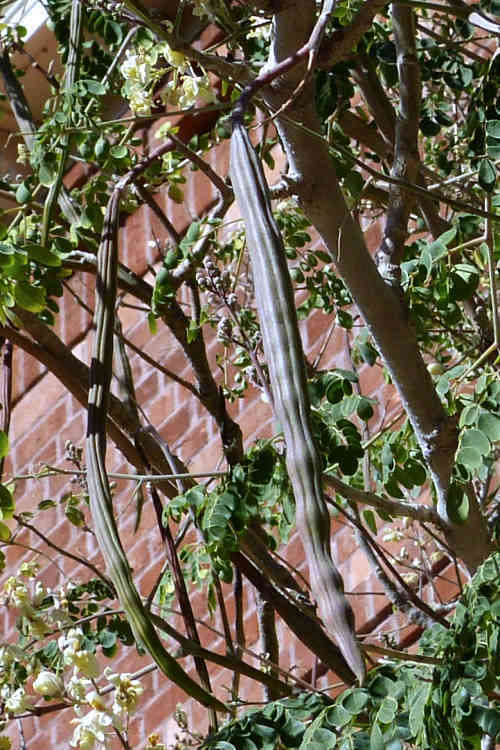 Moringa has the reputation of being difficult to establish, but easy to grow once established. 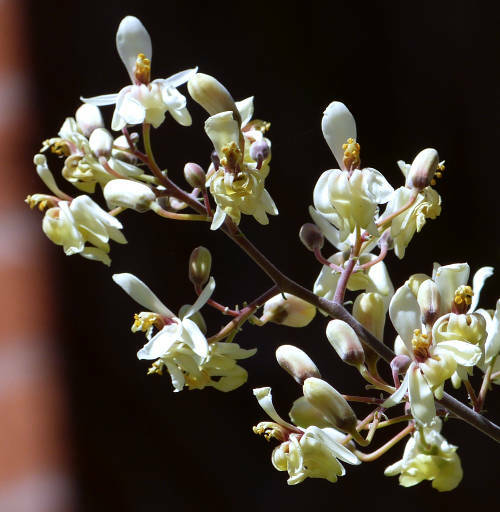 See the section titled Propagation for instructions on growing Moringa seeds successfully. Some cultivars are grown for their leaves, others for their oily seeds. Check the characteristics of the plant you will be purchasing.